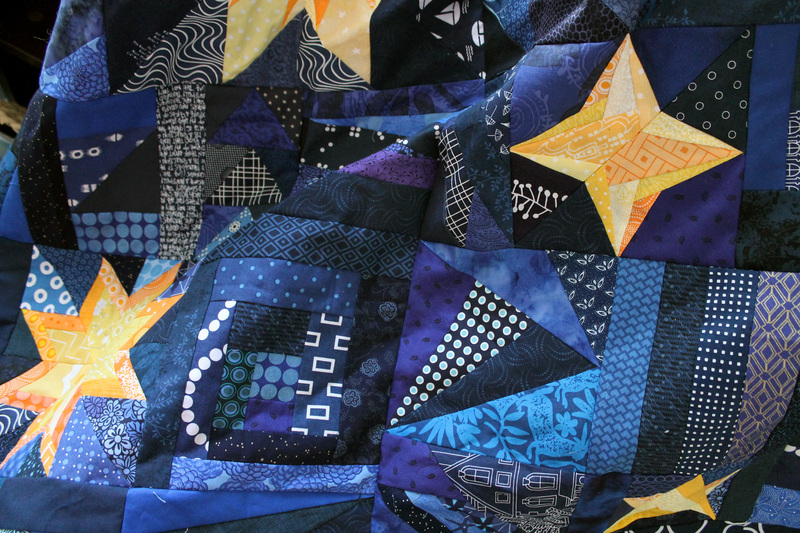 Starry Night quilt top is now finished….It was quite a task to get this paper stiffened behemoth through my little old domestic machine but I did it… with only a few minor injuries. The most interesting view of this creation, I think is the back, with all the paper pieces still in tact. You can see just how much variety there is in the night sky. I had a blast playing with the EQ7 paper piecing library and I do not think this crazy would not have been possible without EQ. I think if I had set out to do the sky this way in the beginning I am sure I would have found some way to talk myself out of it. As it was I just did it bit by bit, not really fully understanding how insane I was being…. Once the paper is off I will post photos of the complete top… at the moment it is just to stiff and unruly to handle…. next week I promise a full quilt top reveal. Absolutely fabulous! It’s just stunning. It has turned out wonderful! Love those bright colours! What a wonderful quilt!! I totally love your sense of style and color and your creativity. Thanks Polly. I think it helps to have a touch of crazy in the family genes too! Lol. Oh! 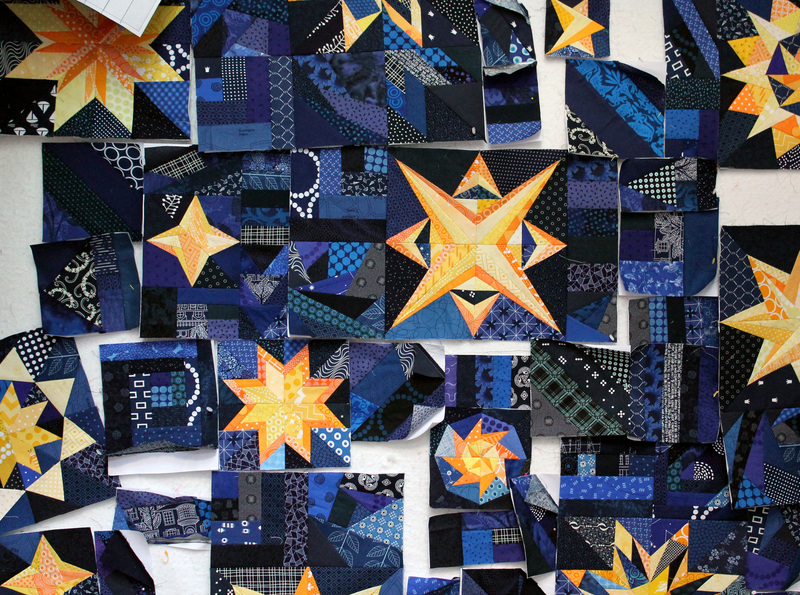 I didn’t realize all the blues quite were Also paper pieced! That makes this all the more impressive, and interesting….. can’t wait to see the next installment. Love, love, love this. I have already started a fabric hoard to attempt my own. Beautiful. Let me know if you want any of my scraps! I am a little over blue at the moment! My dream is fabric shop with you. Love your choices! You have certainly given Van Gogh a run for his money with this one. Simply beautiful. Congrats on sticking with it…it’s a masterpiece! Oh it turned out so great! I love the little tiny stars, so cute! If it was madness, then at least it was divine madness. That is such a beautiful quilt, and your husband is right to insist you keep it. I think this one will always be one of my favourites among your lovely quilts. Good luck with removing all the paper – one of my least favourite jobs! I am already carting so many quilts home…but you are right about the gossiping. We will have to find something else to do instead. Maybe the Brisbane Art Gallery for inspiration. This is magnificent! Exactly right that you should keep it. Exactly right that you have given Van Gogh a run for his money. 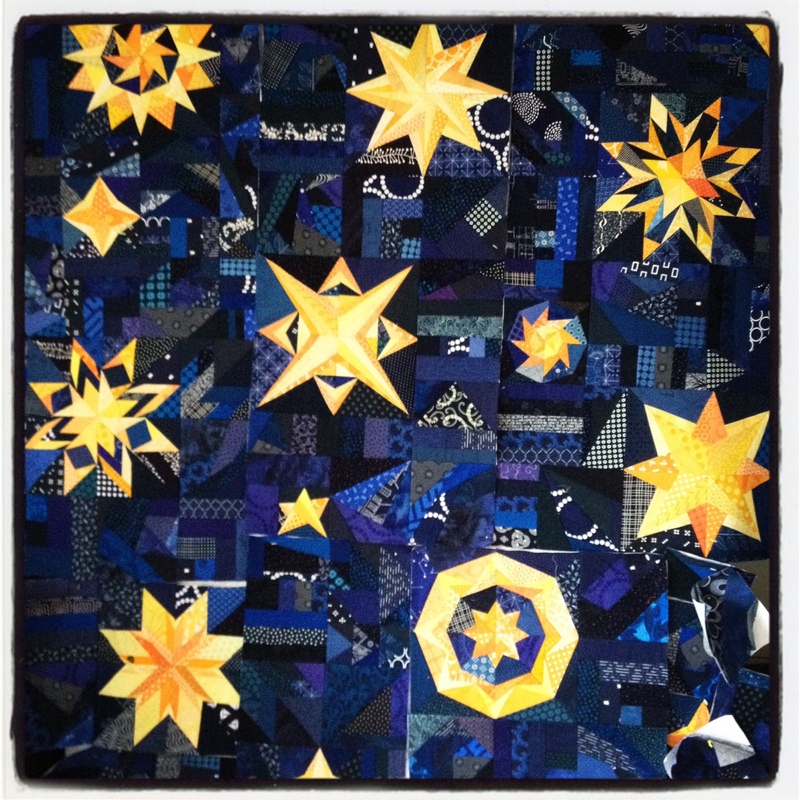 This is one of my favorite quilts ever … not just your quilts … ever!!! Thanks Pat. I must admit it is my favorite make so far. I can not wait to see what a long arm quilter brings to it. This is beautiful so far! Love seeing the paper back. Can’t wait for the full reveal. This is absolutely amazing. Even the sky is intricately paper pieced; wow! 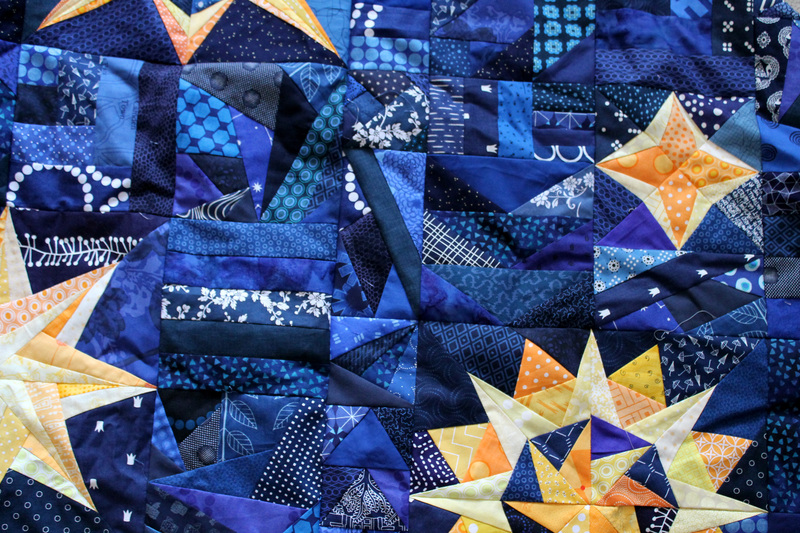 As a lover of paper piecing, but also one who has never made a paper pieced quilt larger than 20″x27″, I am floored by the fabulousness of this quilt. I agree, you’ve given Van Gogh a run for his money! To actually make the quilt work I felt I needed to paper piece the sky…it is hard to get good seams etc when sewing paper backed pieces to fabric, particularly on this scale. Of course in hindsight I should have taken the paper off the stars but I was too late into the process when I had that revelation. Lol. I love all the blues and stars. Beautiful!! It’s gorgeous! I can’t wait to see the whole thing! 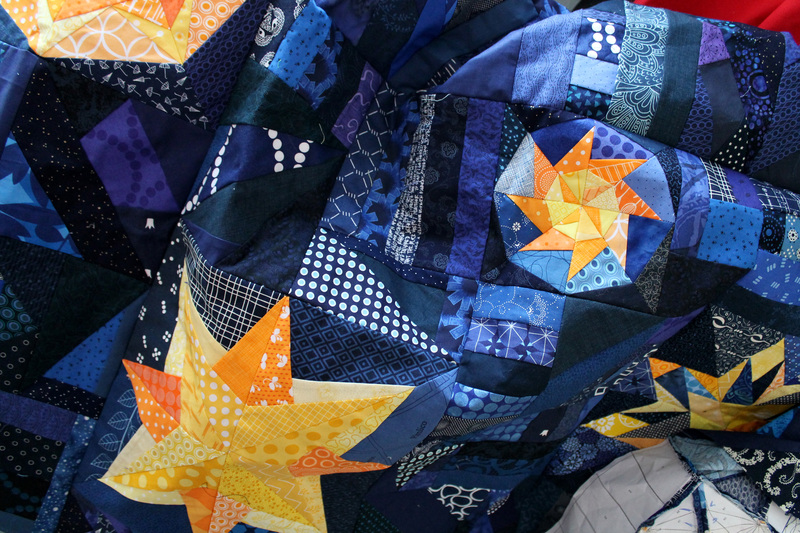 The sneak peeks of bits and pieces are amazing, so I can only anticipate seeing the whole quilt at once. The amount of work and dedication it’s taken to complete your vision is truly inspiring! Once I had the idea it was hard to let it go…no matter how crazy it seemed or how much “over” blue I was. The different shades of blue give the sky a lot of depth. I had to be brave with some if the colours and patterns I added but it worked in the end. There is only one piece of sky I am not sure about and it is too late to fix it now! Wonderful praise indeed. I love it. Amazing!!! It must feel like such an accomplishment to finish such a piece of work. WOW Cath, what I admire over and over again is your ablosutely ingenious feeling for colours!!!! WOW!! is right. All the words above are right. Positively stunning. This is a show stopper! definitely show worthy! Wonderful creation, can’t wait to see it in person! What a really gorgeous quilt. Such perseverance!! The result is fantastic. Have you ever tried the “leave in” non-woven paper substitutes like “Ricky’s stable stuff” or Sharon Schamber’s “Secret Foundation”? They say that you can use it as though it were paper and leave it in the quilt. 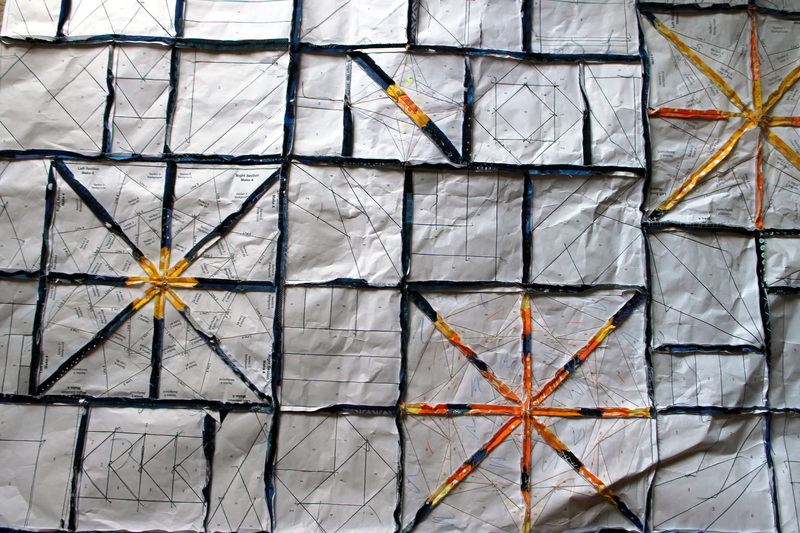 If there ever was a project that needed something like that your quilt would be nominated. This is truly lovely. 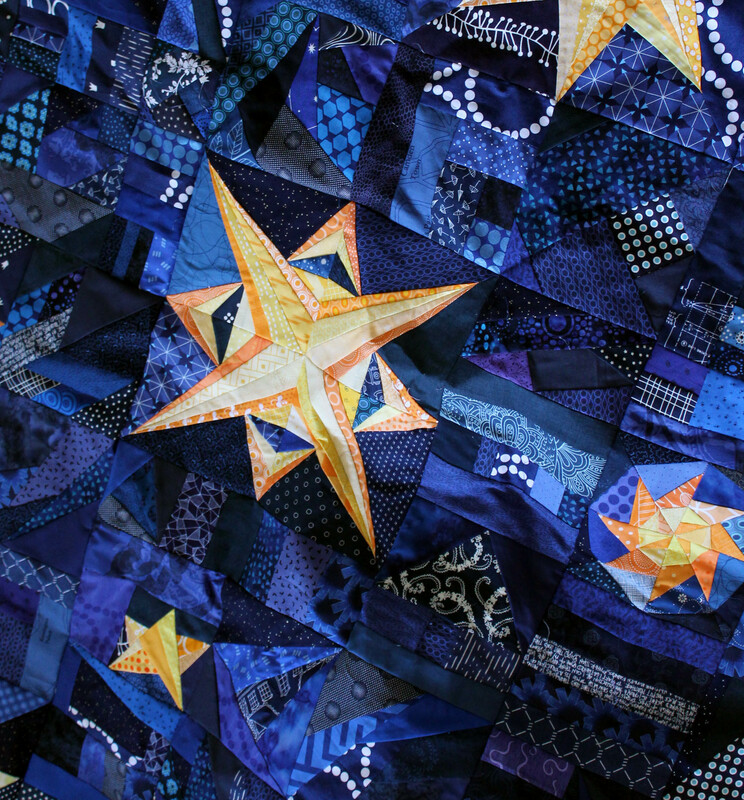 Starry Night is simply wonderful – I have loved every block you have shown along the way and it is getting very exciting to be so close to seeing the whole quilt top in its entirety – your work is amazing and Van Gogh would be proud of you – hee hee – just a joke – a take on his painting titled Starry Night. WOW I am in awe!!!! Beautiful colors and piecing!! Teje I love that idea. Too cool. Lesley you were not the only one wondering how the crazy would end up looking. It ended much better than I thought! Cath ~ what a amazing piece of work this is ~ sure hope we get to see it in person! IT is AWESOME! I can’t help shouting! 😄 I am inspired. Thank you for sharing. Perseverance pays off!! This is a real winner!! It looks amazing, but I do not envy your having to rip out all that paper. What a job! Fantastic! Can’t wait it see it all! This quilt is just amazing! I can’t wait for the full reveal!